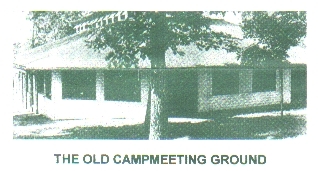 On June 7, 1881 a Dixon District Methodist camp-meeting committee met at Franklin Grove and agreed to purchase a 10 acre tract from Isreal Zug, just west of the Franklin Grove Methodist church, for the purpose of holding a camp meeting at a cost of $1500 for purchase and needed improvements. For more than three decades an annual district camp meeting was held. In the early 1880's a visit to the campgrounds for a "big Sunday" by Frances Willard drew 5,000 visitors with several thousand additional persons arriving too late for her speech. When the camp meeting movement faded in the 1920's, the Chautauqua Meetings, local gatherings and use as a puglic swimming pool allowed the grounds to remain useful. The campgrounds were sold in 1944 at auction, were resold, and remain in private hnds today. 2003 Summer Harvest Festival Committee Welcomes You!